The Bank Holiday sale had more stock on offer with little change in prices. E O’Doherty, Drumquin 525k, £1,070; 465k, £935, A Sproule, Aghyaran 550k, £1,105, T Young, Killen 570k, £1,125; 530k, £1,040; 550k, £1,065, J McGaughey, Donemana 510k, £990, G N Armstrong, Lack 500k, £960; 405k, £930; 450k, £960, William Johnston, Lack 590k, £1,120; 550k, £1,040; 500k, £1,050, J Haughey, Creggan 460k, £1,015, G Sproule, Castlederg 430k, £910, M Gallagher, Mountfield 410k, £860, C Farquhar, Dungannon 470k, £975, S Gallen, Scraghey 455k, £930, Geo Earls, Belleek 360k, £790; 385k, £810 and S Donaghy, Donemana 330k, £715. J Haughey, Creggan 530k, £1,100; 450k, £920, D Wilson, Beragh 505k, £1,040, A Keys, Clogher 505k, £1,035; 570k, £1,120, R McIlrea, Newtownstewart 550k, £1,120, K Ward, Drumnakilly 565k, £1,150, F McAleer, Plumbridge 575k, £1,170, P McLaughlin, Cabragh 575k, £1,135; 465k, £950, M Mullan, Mullaslin 435k, £970, P Conway, Loughmacrory 435k, £950; 440k, £955; 490k, £1,000, S Doherty, Killeter 500k, £1,085, M Gallagher, Mountfield 380k, £870 and D Jefferson, Sixmilecross 315k, £720. N Patterson, Clanabogan 580k, £169, H Gallagher, Mountfield 720k, £164; 670k, £164, Ed Ginn, Ederney 800k, £164, J Sloan, Irvinestown 620k, £158, D McAleer, Pomeroy, 720k, £155, J McKernan, Creggan 610k, £151, W T Nethery, Drumquin 700k, £143 and P Conway, Loughmacrory 740k, £142. A. Irwin, Beragh 670k, £116; 690k, £100, Beaverlodge, Drumragh 740k, £110, D Shortt, Drumragh 640k, £105 and M E Kenwell, Dromore 810k, £103; 620k, £100. 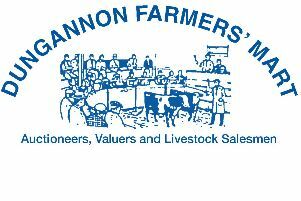 B McBride, Trillick £385 and £360 Belgian Blue bulls, D. McNamee, Newtownstewart £370 Limousin bull, D Longwell, Omagh £335 Belgian Blue bull; £290 Belgian Blue heifer, L Mathers, Strabane £345 Aberdeen Angus bull; £304 Belgian Blue heifer, D McConnell, Knockmoyle £345 Belgian Blue bull, A McFarland, Omagh £340 Aberdeen Angus bull and E Bryson, Donemana £335 Aberdeen Angus bull. Over 200 calves on offer, with calves in the 300kg to 400kg category receiving the most attention. M McCullagh, Glenroan, 460k, £1,010; 445k, £955; 465k, £960; 390k, £935, N McCauley, Urney 435k, £940; 440k, £925; 340k, £800, R Law, Ballinamallard 300k, £765; 290k, £730; 310k, £735, M Kelly, Carrickmore 320k, £780, G Moohan, Kesh 280k, £730; 325k, £775, C Armstrong, Sixmilecross 340k, £800, J Sproule, Garvetagh 310k, £725; 390k, £905, B Kelly, Loughmacrory 330k, £780, P Farley, Sixmilecross 320k, £740, P McPhillips, Carrickmore 320k, £720, William Monaghan, Ederney 335k, £760 and B Liggett, Drumquin 355k, £800. N McCauley, Urney 390k, £980, J F Kelly, Loughmacrory 305k,£745; 365k, £845, C Carson, Drumlegagh 375k, £885; 345k, £750, D Wilson, Carrickmore 345k, £800, Jas Kelly, Loughmacrory 320k, £735; 405k, £880; 410k, £890, K O’Neill, Tummery 270k, £710; 340k, £780; 355k, £810, P McPhillips, Carrickmore 295k, £750, P McGurk, Plumbridge 270k, £665, C McAleer, Drumnakilly 355k, £810; 375k, £855 and H Carleton, Ederney 440k, £1,020. A selection of suckler heifers exhibited by David Kenwell sold to a ceiling of £1,850 for calved animals and to £1,720 for in-calf heifers.